Carpal tunnel syndrome is a common source for the numbness, tingling, or pain in the hands. 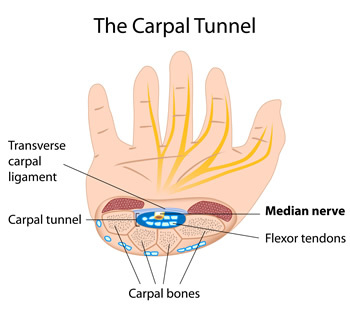 The carpal tunnel is a small tunnel in the wrist formed by wrist (carpal) bones and connective tissue called the transverse carpal ligament. The median nerve (the nerve that controls feeling in the index finger, long fingers, and palm side of the thumb) and the flexor tendons (the tendons that bend the fingers and thumb) travel through the carpal tunnel. Carpal tunnel syndrome is caused by swelling of the tissues surrounding the flexor tendons, which puts pressure on the median nerve. The tissue that swells is called the synovium. The synovium is in place to lubricate the tendons and make it easier to move the fingers. Heredity – Carpal tunnels can naturally be smaller in some people which is usually inherited. Use – Heavy and repetitive hand use over time can lead to carpal tunnel syndrome. Hormones – Pregnancy hormones can make one more prone to synovium swelling. Age – Carpal tunnel syndrome occurs more often in older people. Other conditions – Conditions such as rheumatoid arthritis, diabetes, and thyroid gland imbalance can put one at elevated risk. Generally, it is a combination of factors that leads to the development of this disease. The most common symptoms are numbness, tingling, and an electric shock feeling in the fingers as well as unusual sensations and pain travelling up the arm. You’ll probably begin noticing symptoms gradually and sometimes one at a time. Over time, they’ll become more constant. A feeling of clumsiness may accompany the other symptoms, making delicate tasks like buttoning a shirt difficult. To determine if you’re suffering from carpal tunnel syndrome, a hand and wrist specialist will perform a physical examination to check for muscle weakness and to see if they can reproduce the symptoms. The doctor may also run electrophysiological tests and x-rays to help confirm the diagnosis and severity. Before surgical intervention is considered, we’ll want to try out all nonsurgical options. Bracing or splinting helps keep the wrist in a neutral position. They can be worn during times of the day or during activities that traditionally produce symptoms. Medications such as anti-inflammatory drugs (NSAIDs) can help relieve pain. Changing up the activities that seem to cause the most pain can ease problems. If halting the activity isn’t possible, modifying it in some way might still help. Steroid injections can temporarily relieve symptoms, as well. If these treatments are deemed unsuccessful or unfit to treat your case, surgery will be discussed. Surgery for carpal tunnel syndrome is almost always done as an outpatient procedure, using local anesthesia. The procedure works to increase the size of the carpal tunnel and therefore reduce pressure on the nerve. If you’re experiencing pain, tingling, or numbness in your fingers, you should see a doctor to check for the cause. At Orthopaedic Associates of St. Augustine we’re proud to have Dr. John Stark on staff as our dedicated hand and wrist specialist. If you’d like to make an appointment, please request an appointment online or give us a call at 904-825-0540.